By default, Microsoft has configured Windows 7 to enable and turn on background services when needed. However, some of these background processes are not always in use or required. When they are constantly running, they will consume a large amount of resources and slow down the system’s performance. One of these background processes that many users have highlighted is the wmpnetwk.exe file. The “wmpnetwk.exe” is the key executable for the Windows Media Player Network Sharing Service and it is used to share Windows Media Player libraries (Windows 7 is using Windows Media Player Version 12). Windows Media Player may not be your preferred player and you may not want to have wmpnetwk.exe running to free up some memory, reduce RAM usage and CPU resources. In that case, Windows 7 offers you an alternative to disable and turn it off. To disable and turn off wmpnetwk.exe, users just need to type “services.msc” in the Windows search box to open Windows 7 Services Microsoft Management Console (MMC) snap-in. MMC allows users to manage and configure Windows services that are running on the computer. 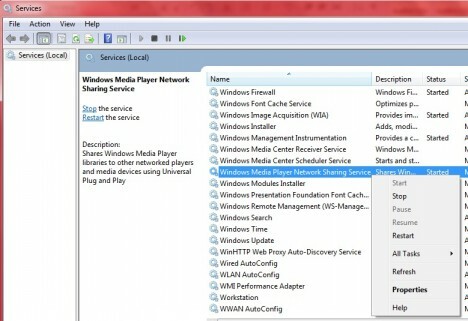 Select “Windows Media Player Network Sharing Service”, right click, and click “Stop” to disable it. Users can go to the Resource Monitor to check and confirm that wmpnetwk.exe is no longer running. 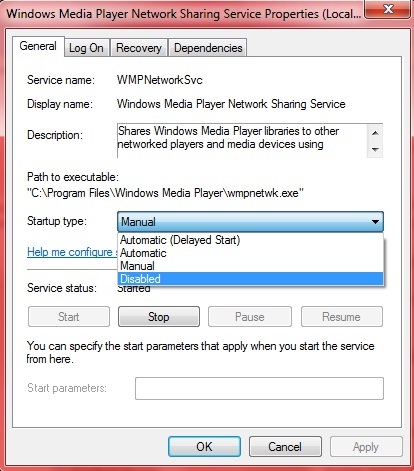 Even though users have successfully disabled wmpnetwk.exe and turned off Windows Media Player Network Sharing Service, this process will be restored every time users restart the computer. To permanently disable this process, users can go to MMC again, select and right click “Windows Media Player Network Sharing Service”, in the shortcut menu, click “Properties”. Look for “Startup type” item, select “Disabled” so that this process will be permanently disabled even when users restart the computer.